So, you’re thinking of going to school. Whether this is your first time entering college or you’re going back to school after an extended hiatus, the decision to enroll in a degree program is not easy. While many factors exist, there are five critical questions every student should ask before enrolling in a college degree program. Question #1 – Am I ready? Prospective students should assess their situation honestly to be sure they have the study habits and the time required to be successful. Enrolling in a degree program takes a lot of commitment and may mean a sacrifice in other areas of your life. If you’re considering an online degree time and self-motivation are even more significant. 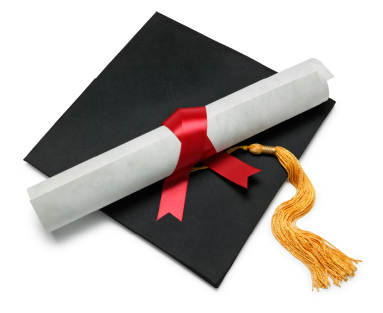 There is often a misconception that an online degree program is easy. This is not the case. Self-paced online programs require a great deal of self-motivation, discipline and organization from the student. Question #2 – What are the school’s qualifications? First and foremost students should check to make sure the school they are considering is accredited by an accrediting body recognized by the U.S. Department of Education. This will help ensure the school is legitimate. Additionally, students should look for any degree-specific requirements from professional associations for the field they are interested in to ensure future employers will accept their degree. Information about the qualifications of the faculty, graduation rates and job placement rates within their field of study are also important. Question #3 – How much student support is provided? If you’re returning to school you will want to look at a school’s student support offerings. Some things to look for may be a full staff dedicated to academic support or tutoring or any programs dedicated to “adult” (see: over traditional college-age) learners. You should also consider the size of classes, as smaller programs tend to offer more support. Question #4 – Can I visit the campus? Visiting a campus can tell you a lot about a program, but it’s not just about checking out the “quad” or dining hall. In addition to taking a guided tour, take time to explore on your own. Also, be sure to sit in a class in your major to get an idea of what the curriculum will cover. Planning to enroll in an online program? Take a virtual tour. Ask the college of your choice about previewing their virtual library, accessing the help desk or giving their tools and resources a test drive prior to enrolling. Question #5 – Are alternatives available? There are different advantages for enrolling in a traditional, campus-based program and an online degree. If you’re not sure which is right for you, it may be helpful to find out if it is possible to take classes in a hybrid format. Many campus-based classes are starting to have online components through online discussion boards, class wikis or even eTextbooks. Seeking out classes in both formats will help you decide which is right for you.